That's what it's all about. Doors and sardines… Getting the sardines on; getting the sardines off. Or so says Lloyd Dallas, the hapless director of a touring company in final rehearsals for an ill-fated production of “Nothing On”. 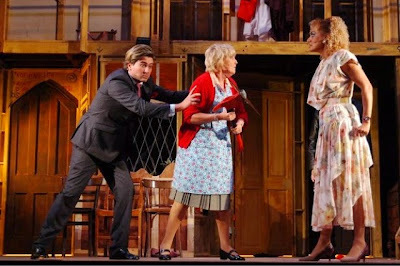 Michael Frayn’s 1982 play is a masterclass in farce, with all the requisite doors and windows, comedy props, dropped trousers and, above all, split second timing with entrances and exits. Richard Foxton’s design for this production uses an impressive and substantial two-tier set on a full revolve, that enables two scene changes, one of which takes place in full view, running acts two and three together without a break and thereby maintaining the manic comic energy after the single interval. Onstage in act one we meet the cast and crew who seem to believe that they are having a technical rehearsal, only to find to their dismay that it is the final dress and the opening performance is only hours away. Among their frustrated efforts to perfect all the lines and stage business we discover their frailties, foibles and indiscretions, and can see that their forthcoming tour is not going to be an easy ride. Act two finds us backstage on opening night. The situations that were being set up during the first act now conspire to sabotage the performance. Most of the action is almost completely in mime, with everyone rushing about frantically and next to killing one another in between entrances and exits, and all the while we can hear the now familiar dialogue on the stage beyond and catch glimpses of the play trough doors and windows. It’s a minor miracle that the curtain comes down with all the cast still alive. A quick scene change accompanied by the music of Madness brings us back onstage again, this time just before a performance toward the end of the run almost ten weeks later. The cast are now beyond the end of their tether and, having seen the backstage antics earlier, the lunacy that “Nothing On” has become has us imagining the mayhem behind the scenes to even greater comic effect than if we could actually see it happening. Frayn has provided a scintillating script, but it takes a great sense of subtlety and timing to pull it off. Bob Eaton directs a splendid ensemble cast here and while the comedy is very slick in the first act it really lets rip in the high-speed antics after the interval. Kim Hartman’s Dotty, is a perfect balance of bumbling and dismay, with her endless plates of sardines and some beautifully executed business with a telephone in the second act. Stephen Fletcher is wonderfully hammy as Gary, with a wig that almost needed its own separate billing and Danny O’Brien’s long-suffering Tim has much lower key humour in his lines but makes the most of them in an immaculately played part. The big star of Nothing On, Belinda is played with larger than life panache by Tupele Dorgu, while Jessica Dyas is splendidly dippy as Brooke, who just keeps on with the text as written regardless of the non-sequiturs resulting from everyone else’s [scripted] ad-libbing, and whose contact lenses spend more time on the floor than in her eyes. Chris Jordan’s rabbit in the headlights Freddy seems not really to be very aware of what’s going on and Phil Hearne is perfect as the old thespian Selsdon, selectively deaf, a little sozzled and completely unable to remember his cues. Stage Manager Poppy is played by Jennifer Bea, and we feel her pain as she tries to hold everything together among the cast while dealing with her own personal frustration with the director, Lloyd Dallas. Dallas is played by Jonathan Markwood, who makes many of his entrances from the auditorium during rehearsals. He completes a great cast with a suitably weary and withering performance as a man on the edge of a professional precipice. I am never quite at ease with the Royal Court’s policy of close-mikeing its performers but although it makes some of the comings and goings a little confusing with the position of voices unfocused it does come into its own in act 2, when we get to hear the dialogue from the invisible actors onstage and the sound balance works here better than anywhere else in the performance. This is a hugely entertaining, high-octane performance of one of the great pieces of late 20th century English farce and well worth a visit. It runs to 4th October, and don’t forget that at the Royal Court you can book both the play and a pre-show meal at a table seat for a bargain price.